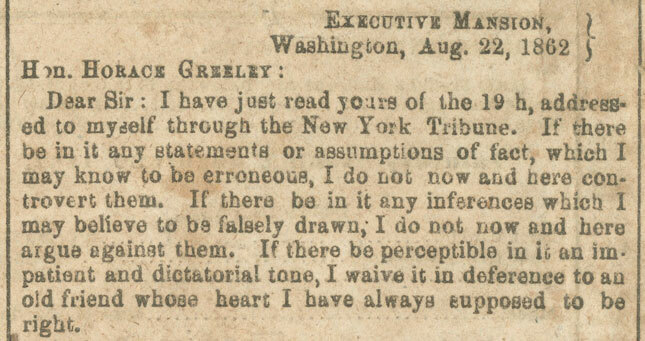 The Confederate newspaper Richmond Whig printed Abraham Lincoln’s famous reply to New York Tribune editor Horace Greeley on the front page. Greeley’s August 20, 1862 letter, known as “The Prayer of Twenty Millions,” urged Lincoln to emancipate all the slaves in Union-held territory. Lincoln responded on August 22, declaring that his paramount goal was to save the Union—regardless of its effect on slavery—as well as his personal views that all men should be free. “My paramount object in this struggle is to save the Union, and is not either to save or to destroy slavery. If I could save the Union without freeing any slave, I would do it, and if I could save it by freeing all the slaves I would do it; and if I could save it by freeing some and leaving others alone, I would also do that. This letter is regularly cited as proof that Lincoln did not intend to abolish slavery, but unknown to Greeley and most Americans, Lincoln had already drafted the preliminary Emancipation Proclamation and was only waiting for a Union military victory to deliver it. Moreover, Lincoln makes a “divide and conquer” rhetorical move: he splits the issue, stating his constitutional duty as president is to keep the Union together, but simultaneously expressing his personal view of universal freedom. The Richmond Whig is one of the less common—but still important—newspapers from the capital of the Confederacy. In Four Years in Rebel Capitals: An Inside View of Life in the Southern Confederacy from Birth to Death, journalist T. C. DeLeon wrote that the Richmond Whig was among the South’s best wartime newspapers. The Whig was allegedly involvement in a terror plot against New York City during the Civil War. The paper reputedly worked with the Confederate government to publish advertisements and editorials conveying secret messages to Southern sympathizers in the North. In October 1864, the Whig supposedly ran an editorial that signaled Southern supporters to set coordinated, widespread fires in New York, take over city and federal offices, and capture Major General John Adams Dix, the city’s military commander. Read Lincoln’s letter, published 150 years ago today.